The specific date for the grand opening and tours for the Bailey Medical Center in Owasso is not quite certain, but is still anticipated for later this month (Nov. 2006). 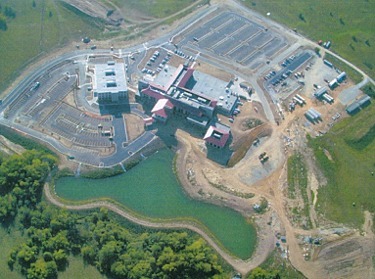 The campus includes a 3-story (73-bed, 5 operating room) hospital, an educational center, and a medical office building. CEO Alfredo Ontiveros, Jr., addressed the Chamber and stressed the Bailey Medical Center "will provide exceptional, state of the art healthcare services, delivered with compassion and respect, by a highly trained team of professionals." The center was made possible through the vision of approximately 60 local physicians-investors and the efforts of the Larkin Bailey Foundation and Ardent Health Services. A second Owasso hospital is also set to open soon. This recent aerial view of the soon to be completed Bailey Medical Center near 116 St. E. Ave. (west of Garnett) and 106 St North between Collinsville and Owasso was provided to the Collinsville Chamber at their monthly luncheon meeting Thursday Nov. 2nd, 2006. 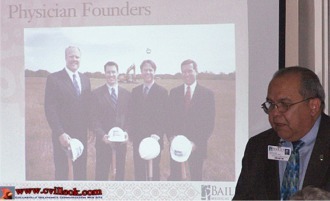 Alfredo Ontiveros, Jr., CEO of Bailey Medical Center showed slides including the first of the now 58 physicians invested in this project. Ontiveros and Crystal Dye answered questions for the Chamber about the new nearby medical facilities.